The waterfall, which is situated right in the centre of the village of Lúčky, has been a national natural monument since 1974. 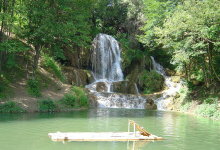 Water falls from a travertine terrace in a height of 12 m above several small lakes. The runnel itself is not very interesting but its tributaries contain gypseous-earthy waters which gave rise to the ornamentation of the waterfall. The village of Lúčky lies in a valley on a border of a mountainous region called Chočské vrchy and is surrounded by woods. The valley is open to the south, towards villages of Liptovská Teplá and Kalameny. The dominant hill of the regions of Dolný Liptov and Orava, Veľký Choč (1608 m above sea level), can be found nearby. The hill Plieška (977 m above sea level) rise above the northern part of the village. A cave inaccessible to public (105 m long) lies in the hill Smrekov (1024 m above sea level) which is situated to the west form the village. The waterfall and travertines of Lúčky create a natural boundary between a spa and the village itself. The travertines (rock faces and hillocks), which have formed of gypseous-earthy waters, were declared a national natural monument in 1975. They fill an area of 3.8 hectares. The surroundings is ideal for bike trips, although no bike tracks have been build in the village yet. Less demanding bikers can visit the nearby village of Bešeňová or the lake Liptovská Mara. There is also a possibility of passing through mountains termed Sielnické vrchy to the region of Orava but this is only recommended to more experienced bikers. A cinema can be found in the medical institution Choč. Unfortunately, it is out of operation nowadays. A mini-golf course, located in the area of the institution, is a good place for families with children. The hill Veľký Choč, shaped like a pyramid, is one of the most beautiful hills in Slovakia. It was glorified by many poets, e.g. by P. O. Hviezdoslav who came from the village of Vyšný Kubín (in the region of Orava, just under Choč). There is a ski lift under Smrekovec which offers an opportunity of skiing for less demanding skiers (the slope is not snowed up artificially, it is just maintained by a BOMBARDIER caterpillar). The ski lift operates during weekends, holidays and on orders.